We are today comforted by the words of Our Lord in Revelations 21:4 which says: "And God shall wipe away all tears from their eyes; and there shall be no more death, neither sorrow, nor crying, neither shall there be any more pain: for the former things are passed away." Softly and quietly on Saturday, February 2, 2019, our Almighty God called Ms. Barbara Clemons to come home for her eternal rest. 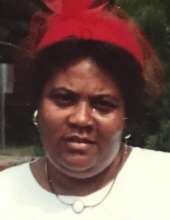 Barbara was born on Saturday, August 9, 1947 to both the late Walter Bergamy, Sr. and Beatrice Hill in McDuffie County, GA. She was a devoted and dedicated member of the House of God Church of God in Christ (HOGCOGIC) for over forty years. She loved the Lord with all of her heart. Barbara enjoyed cooking and sewing for many people. She was employed with the former Thomson Company of Thomson, GA before becoming a housewife. She was preceded in death by a son, Dewayne Martin Clemons and a brother, John Henry Mayes, Jr. Barbara was married to the late Dennis Clemons for over twenty years. During their union six children were born. She leaves to cherish her memory: three daughters, Mary Clemons of Atlanta, GA, Velvet Clemons of Camak, GA and Cheryl Curry of Thomson, GA; two sons; Tracey (Lafayette) Clemons of Graniteville, SC and Dusty Clemons of Nashville, TN; thirteen grandchildren, Mario Clemons, Christopher Bernard Johnson, Quentin Clemons, Jarvis Johnson, Quanisha Miles and Tracie Nicole Clemons, all of Thomson, GA, Zavus (Kisha) Clemons of Atlanta, GA, Tranay A. Clemons of Leesburg, GA, Travia A. Clemons of Athens, GA, Jermaine of Miami, FL, Ronald of Euclid, OH, Ciara and Kiara of Killeen, TX; nine great-grandchildren; four sisters, Jeanette (Charlie) Daniels, Johnnie Mae Mayes, all of Thomson, GA, Gloria Jean Williams and Carolyn Ann Robinson, both of Washington, DC; one brother, Walter Bergamy, Jr. of Blandenburg, MD; three aunts; one uncle; a host of nieces, nephews, cousins, other relatives and friends. To send flowers or a remembrance gift to the family of Barbara Jean Hill Clemons, please visit our Tribute Store. "Email Address" would like to share the life celebration of Barbara Jean Hill Clemons. Click on the "link" to go to share a favorite memory or leave a condolence message for the family.